I’m not really sure how to start a blog about our first Christmas in Chile, so this sentence will have to suffice. This was our first Christmas spent in another country and without our families. Thanks to technology, we were still able to be part of our families’ Christmas celebrations. Like most years, we spent Christmas Eve with the Harts and Christmas morning with the Ludlows. Like every year, Christmas Eve was a small, quiet affair and Christmas morning well, wasn’t. It’s nice to know that nothing’s changed—that even though we were unable to be with our families in person, Christmas still happens just like it always has. Mom still read the Christmas story, Joey and Hannah still fought, and I still found it hard to understand everything that was going on. Here in Arica, in the few weeks leading up to Christmas, Santa rides around on the back of a flatbed truck. The truck is decorated like a sleigh and has lights and music playing and is normally followed by a long chain of cars, all honking their horns and blaring sirens. Santa and his helpers throw candy to the children (and Gringos) that run outside to catch a glimpse of the mini-parade. Also, there isn’t just one Santa that drives around making a ruckus, there are several—maybe more. We were at a local church for their Christmas program a couple of weeks ago, and they had to stop the entire program to wait for Santa to pass through the neighborhood because it was so loud. In the few days before Christmas, it seemed like Santa was always passing through. Speaking of Santa, his delivery method is slightly different here in Chile. Viejito Pascuero, as he’s called here, is a little more sneakier than the Santa we’re used to. Santa comes while you’re sleeping, but Viejito Pascuero comes while you’re awake. On Christmas Eve, the family gathers to have a nice dinner. At midnight, someone hears Viejito Pascuero outside and the kids all run to see him. While the children are outside looking for him, he leaves their gifts under the tree. We spent Christmas Eve with our friend, Alonso. He has lived in Arica since June and the rest of his family lives in Santiago and Talca—nowhere near Arica. We shared empanadas, my Christmas cookies, and pan de pascua. 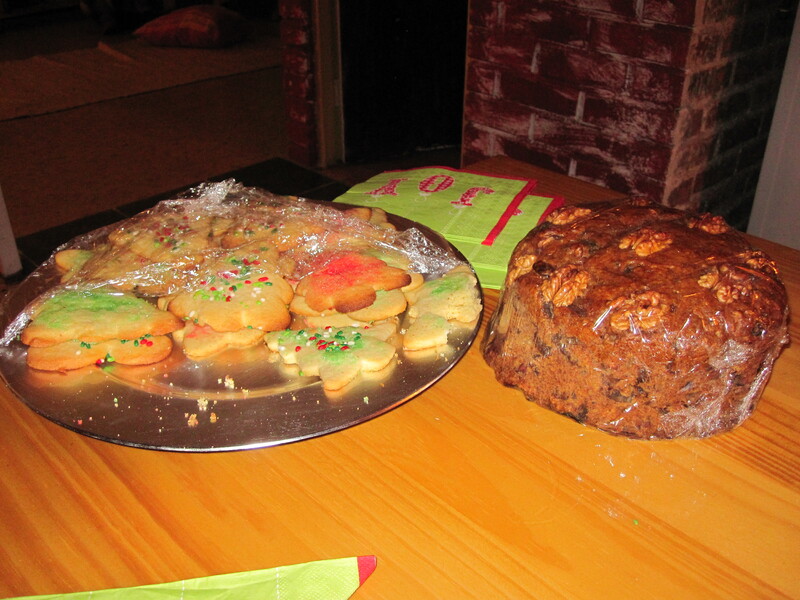 Pan de pascua is a mixture of rum and fruit cakes. I couldn’t try it because of the walnuts, but Blake liked it. We stayed until it was time to head home to Skype with the Harts. We’ll see what New Year’s Eve brings, but I have a hunch that it’ll bring a lot more fireworks and a lot less sleep! Here are some pictures we’ve taken this December. Enjoy!